More essay or experimental film then documentary, SMALL TALK is a kind of waking dream filled in Havana Cuba. I have no idea if it means anything but it sure is damn interesting to try and work out what that might be. Recommended. The life and times of four ankle monitors and the people wearing them. This intriguing film fills in what exactly it means to have to wear an ankle monitor, which is something we've all heard about but very few of us have actually seen. I was riveted since the film fills in small little details about everyday existence with one that I never considered. Recommended. 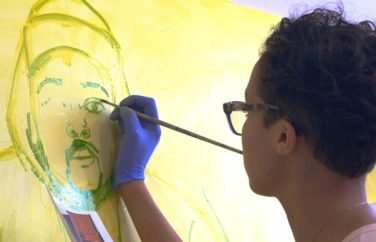 Portrait of Jordan Casteel who paints portraits of black men. A wonderful look at an artist and her work that does what the best art bios do which is give an understanding of both the artist and their work. One of the best shorts at DOC NYC. 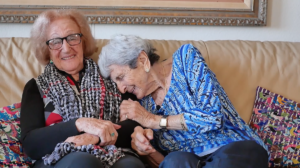 Wonderful portrait of Kitty and Ellen two survivors of the Holocaust who have been friends for almost 75 years. WHat can I say about this film other than its glorious time with two charming ladies. A must.